I made this forgotten dish for supper recently, and it reminded me how easy and delicious it is. 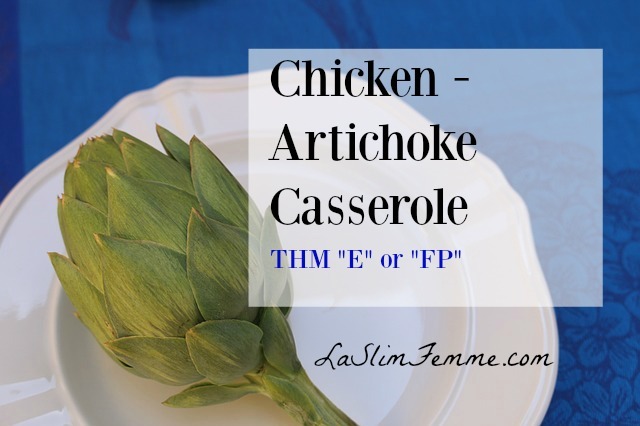 I love artichokes, and this casserole is another way of getting them into my diet. Not only are they delicious, but artichokes have many health benefits. Chicken-artichoke casserole is a Fuel Pull fuel if you serve it alongside non-starchy vegetables. However, I serve it over rice for an E fuel. It makes a lot of delicious sauce and the rice helps soak it up. The almonds are optional but add a nice bit of crunch. Heat oil and cook chicken pieces until golden brown. Add mushrooms, garlic and artichoke hearts to the pan and cook for a few more minutes. In a mixing bowl, combine the almond milk, tomatoes, herbs, salt and stir well. Combine chicken mixture with milk and tomato mixture, stir well. Grease a baking pan with cooking spray. Add all ingredients to baking pan, then sprinkle with chopped almonds.